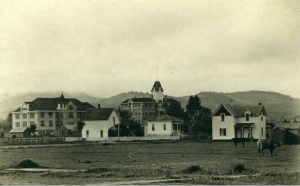 In the early 1900s, Corvallis was a small, peaceful sort of town. The population was about eighteen hundred people, eventually growing to seventy five hundred people by 1930 (Population of Oregon Cities, Counties, and Metropolitan Areas). Most of these people were home owners, and although the homes were small and in meager conditions, the people took pride in the fact that the homes were theirs. This also created very close knit families and communities. Corvallis Academy was the community college established in 1856. It was informally known as Oregon Agricultural College in the 1890s and 1900s, resulting in an official and formal name change in 1927 to the Oregon State Agricultural College (Oregon Encyclopedia). The school fit in well with the agriculturally established town. There were two primary residential districts on the north and west sides of campus and downtown. In each rural neighborhood, there was anywhere between one to several barns, as most people owned horses for transportation as well as cows and chicken in order to sell milk and eggs. It was definitely a farming community, as farms lining the outskirts of town provided employment to most of the residents. To add on to the sleepy, ranch style town Corvallis was, there was also a 9 o’clock curfew every night, enforced by the fact that every store and shop closed at that time as well. There wasn’t much of a “night life,” so men tended to gather in hardware stores and barber shops as their go-to hangout locations. Jess Spencer’s Barber Shop was a favorite meeting place for the men to escape their families, spit tobacco, and tell jokes (Minerva Kiger Reynolds, pg 16). Sunday mornings were considered sacred, as people were called to church by the loud bells that could be heard throughout the town. There were multiple churches, eight of which were within the same three block radius of each other, showing just how much of a demand it was for everyone in town to attend church, as well as for children to attend Sunday school. Although both political parties had a rivalry in Corvallis, the parties really only differed in the fact that the Republicans wanted to impose a high tariff on foreign trade and the Democrats wanted free trade. Election day was a very patriotic day in the town, consisting of parades and colored wagons to take voters to the polls (Reynolds, pgs 42-43). Since the townspeople worked hard days and long hours and had not much money to waste on hobbies and activities, the fun of riding bicycles was the most popular free time activity in the town. Bicycle clubs were formed, and there was even a bicycle path between Corvallis and Albany for the clubs in both towns to ride. 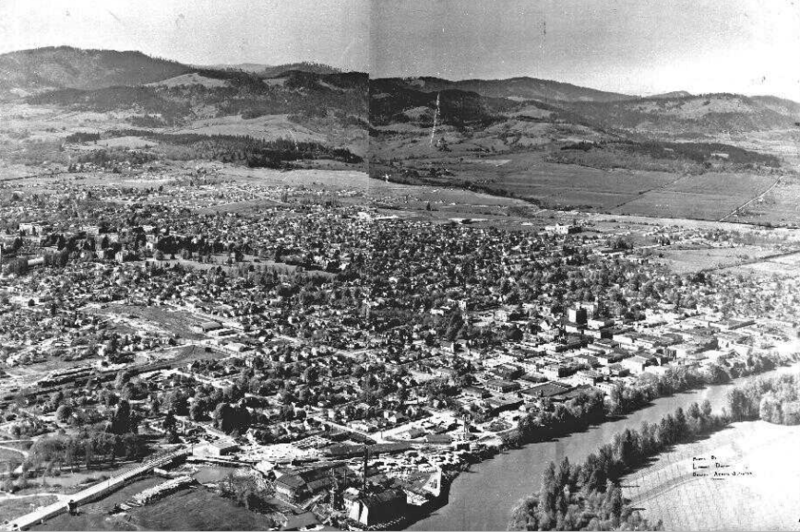 Aerial view of Corvallis, showing downtown (lower right), Oregon State Agricultural College (middle left), and residential districts north and west of downtown and campus. Courtesy of photographer and former OSAC student, Walter Rawalt G. Baker, 1930. View of campus buildings from the southeast, courtesy of photographer Walter Rawalt G. Baker, May 21, 1905. 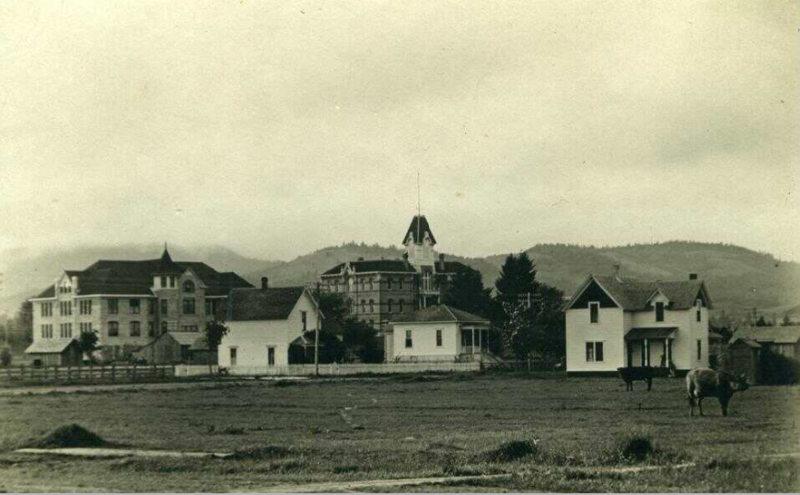 The Oregon State Agricultural College; what we now know as Oregon State University, saw great development during the early 1900s because of the direction of Thomas Gatch. With the previous purchase of new farm land, the campus was able to grow in size and numbers. With an increasing attendance from 85 students in 1890 to 1,352 in 1908 and the ability to grow rapidly due to local funding. Additionally, programs such as mining, forestry, and the establishment of a newspaper boosted the significance of the college gaining national importance before 1910. 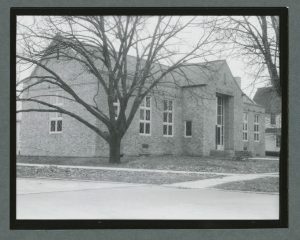 By 1930 the school had grown immensely with more students and new programs including; Agriculture, Commerce, Engineering and Mechanic Arts, and Domestic Science. (Oregon Encyclopedia). 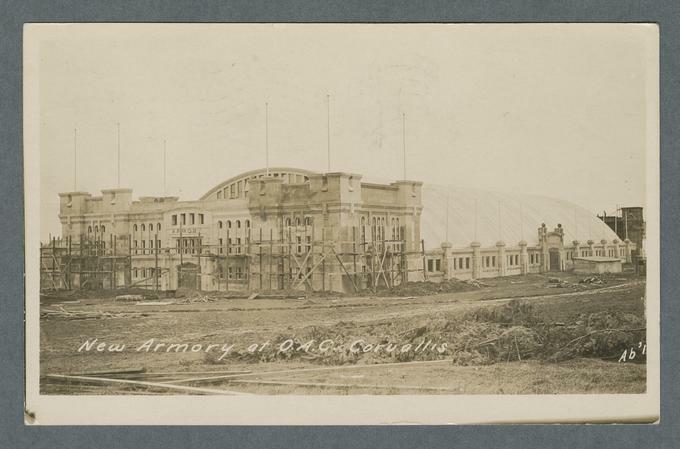 New Armory at Oregon Agricultural College, 1909. The Whiteside Family migrated to Corvallis around 1890 consisting of 5 family members who became very engrossed in the economy of Corvallis. Two of the brothers; George and Samuel Jr. created many businesses together including a grocery store, shoe store, and transfer service. Two of the other brothers Charles and Clarence began and operated their own company called Whiteside Motor Co. Beginning in 1906 George and Samuel began touring the Valley with vaudeville type tent shows being the first with this type of technology in the area. They then went on to create the Palace theater in 1908 which lead to many theaters along the road spanning into the 1930s. Corvallis is relatively small compared to other cities in Oregon at this time, and so we can see a vast amount of small local entertainment events being hosted in venues across town. A popular destination for theatrical shows and art exhibitions was at the Corvallis Opera House, located on the corner of Fourth and Madison. 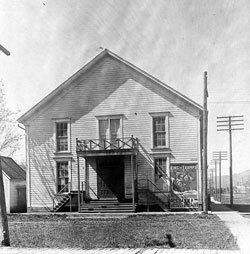 The local residents of the town helped raise the money through subscription and contributed their labor to build it in 1870.The Opera house was initially used for band performances, roller-skating, dancing and box socials. 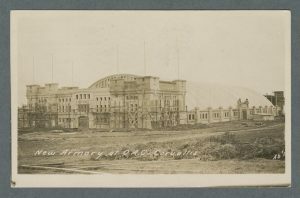 A notable event that occurred at the Opera house in 1901 was a memorial service in honor of United States president, William McKinley who had been assassinated that year. By 1910 there was an increase in professional entertainment, such as two popular productions The Taming of the Shrewand Pinafore. By 1914, the era of travelling dramas and minstrel shows was coming to an end, and thus Frank Groves, the manager of Opera House decided to rent a major part of the building to the Gazette-Times newspaper and remained there until 1926. What was once the hub of entertainment for Corvallis was eventually torn down in 1950 where the site became a parking lot for a Safeway store. There was a constant danger of fires in Corvallis throughout the late 19thand early 20th century. The city was eventually able to establish a fire department around 1883. However, the firemen were all volunteers, which made the women of Corvallis feel obliged to help. In that same year, they organized the Corvallis Coffee Club, with a duty to serve coffee to the firemen while they were fighting fires. All of the prominent women in town joined and it became a very elite club. Their typical meeting place was every month in the ballroom of the City Hall located on Forth Street and Madison Avenue. Eventually, the Coffee club became the Corvallis Woman’s club. Not only did the title of club change, but it became more of a lady’s book club. The effort of nine members of the club established the first Corvallis Public Library, which officially opened on October 30th, 1899. By 1923, the library served over 1000 regulars and had an inventory of around 4000 books. In 1931 the property was fully paid off and funding for a new building took place. The city of Corvallis voted for a taxation of 25,000 for a new library building. 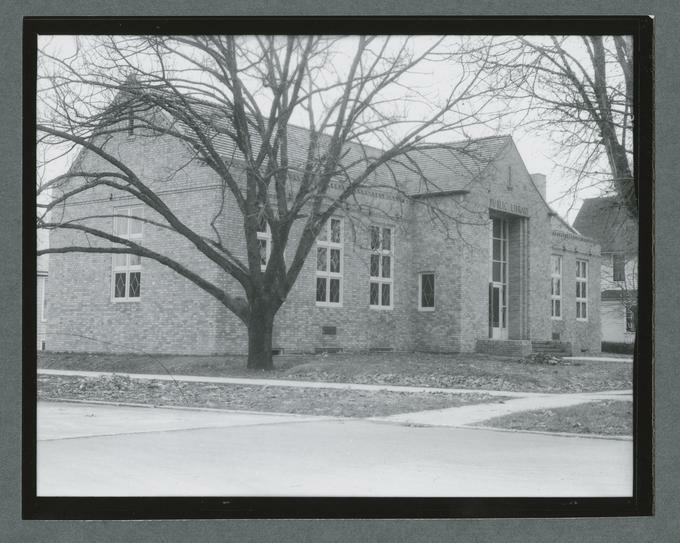 That next year, a new 5,200 square foot library was built and designed by a renowned Italian architect named Pietro Belluschi. 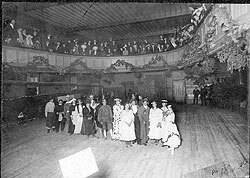 In 1900, shows put on by travelling stock companies began to come and play for the people of Corvallis at The Opera House, which had been in operation since 1870 (Minerva Kiger Reynolds p. 31). While the space had been historically utilized for recreation, ceremonies, and conventional plays, this was the beginning of the Opera House’s foray into filmic exhibition, as it would become one of the earliest exhibition sites for moving pictures in the city. The early portion of the decade experienced an infrastructural upgrade, as paved roads were needed to accommodate the population that ended up tripling from 1900-1910 (Robbins, William G. p.1). This population increase was a key event in catalyzing the necessity for more recreational entertainment for the townspeople, and the growing popularity of moving pictures coincided with that growing population. 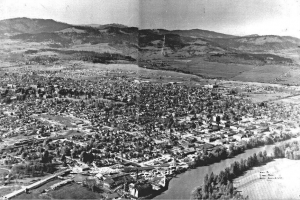 In 1905, the city of Corvallis utilized local option law to turn Corvallis into a dry town. (Robbins, William G. p.1). This was well ahead of the beginning of prohibition, and nearly twenty years before the end of it. 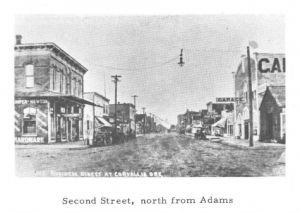 As Corvallis was mainly a “family town”, voters felt this was a good way to combat the problematic trio of saloons and their patrons in the town. Minerva Kiger Reynolds describes mainly unmarried men, who never quit drinking, utilizing the saloons and threatening the tranquility of the families in the area (p.20). The newly established dry-status, increasing population, and limited entertainment venues created a perfect opening for the industrious Whiteside brothers to step into and take hold of. In 1908, they opened the Palace and Star theaters. After proving successful in their entertainment ventures, they would go on to open the prestigious Majestic and Whiteside theaters in 1913 and 1922, establishing a quasi-monopoly on moving picture exhibition in the area (Hall, Bennett, p.3). A fire in 1927 destroyed the interior of the Whiteside, causing it to close down for an entire year (Maguire, Addie p.1). 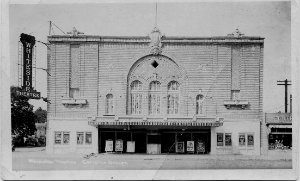 The Whiteside Theater circa 1925, courtesy of The Corvallis Advocate. The 1920’s marked the beginning of a change in multiple facets of the city of Corvallis. With suffrage passing in 1920, women garnered the right to vote. As Corvallis was a traditionally conservative town, many local men viewed this event as problematic, believing that voting should be reserved for men (Reynolds, Minerva p.52). Furthermore, the onset of the great depression was the key event which led to the eventual slowing down of the early-century population increase (Robbins, William G. p.1). Population of Oregon Cities, Counties, and Metropolitan Area 1850-1957. Bureau of Municipal Research and Service, University of Oregon. Information Bulletin No. 106, April 1958. Landis, Larry, “Oregon State University,” Oregon Encyclopedia, https://oregonencyclopedia.org/articles/oregon_state_university/#.Wv3DerrwaUk (accessed May 17, 2018). William G. Robbins, “Corvallis,” Oregon Encyclopedia, https://oregonencyclopedia.org/articles/corvallis/#.Wv37HLrwaUl (accessed May 17, 2018). Hall, Bennett. 2009. “Picture Pioneers”. Corvallis Gazette-Times, April 2, 2009. http://www.gazettetimes.com/news/local/focus/picture-pioneers/article_1a5b0768-9a0e-5ef4-8f5d-0eb32a682247.html (accessed May 15, 2018). Maguire, Addie. 2014. “Whiteside Through the 20th Century. The Corvallis Advocate, April 24, 2014. http://www.corvallisadvocate.com/2014/whiteside-through-the-20th-century/ (accessed May 17, 2018). “Oregon State University”. Oregon Encyclopedia. https://oregonencyclopedia.org/articles/oregon_state_university/#.Wv5O0i-ZM_U. (accessed 17 May 2018). Hall, Bennett. “Pioneer Pictures”. Gazette Times (Corvallis). 2 April 2009. Web. “Corvallis Old Opera House.” Walt Whitman House (1938 – 2008) – Camden, NJ – Photos Then and Now on Waymarking.com, www.waymarking.com/gallery/image.aspx?f=1&guid=756c2a59-d72f-4a2b-944e-c8de4c309d5f.